In honor of World Day Against Child Labor on June 12, Winrock will be sharing stories that highlight some of our innovative solutions to combat child labor and provide youth with safe economic opportunities. This article, by Winrock President and CEO Rodney Ferguson, was originally published in June 2016. Mercy Dahn was 9 years old when she began working on her father’s rubber farm in Liberia. At first she dug holes and planted young trees, but as she grew older the tasks grew more difficult and dangerous. She worked with acid that irritated her skin and carried heavy buckets of latex that leaked wastewater into her eyes. She never thought of stopping because her family needed help. Going to school was out of the question. 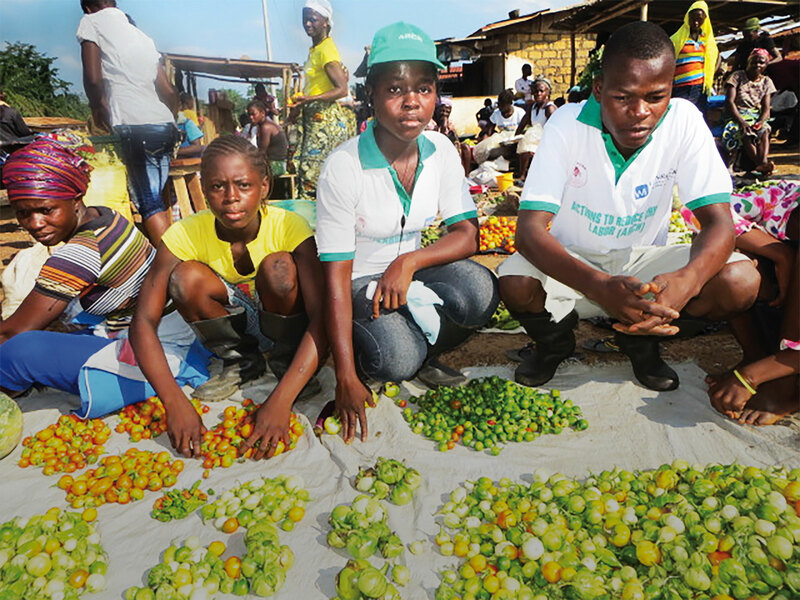 Mercy Dahn, second from right, and other students display their produce at a local market in Karnwee, Liberia. 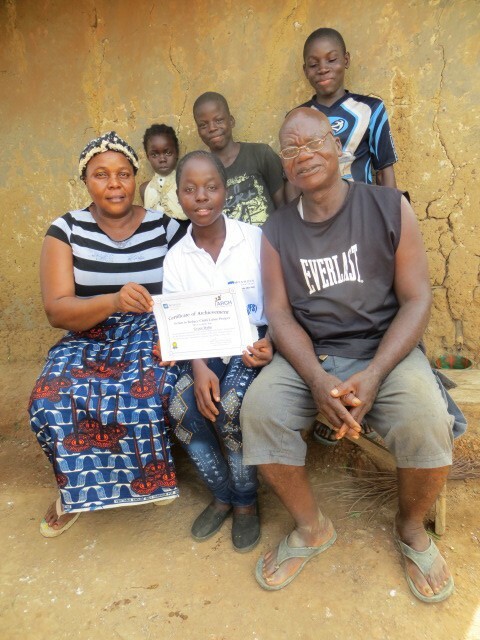 Now 17, Mercy has become a peer mentor in her village. Her life improved in part thanks to the U. S. Department of Labor-funded ARCH program run by Winrock International that brought rubber companies, unions, farmers and communities together to create shared solutions to reducing child labor. Strange bedfellows? Perhaps. But combining forces has strengthened relationships between management and workers, and has made child labor issues harder to ignore. One hundred and sixty-eight million of the world’s children work at unsuitable tasks and for unsuitable hours. Fueled by poverty, low wages, lack of decent jobs and limited access to school or vocational training, child labor denies kids an education and access to skills that would lead to better paying jobs in the future. It robs them of childhood, it’s self-perpetuating, and — worst of all — many of us enable it. Mercy and her family. Her father, right, attended workshops that taught him about the hazards of child labor. Child labor is no longer someone else’s problem. The complexities of modern production make it more likely that something we use or consume every day — from seafood and chocolate to the minerals used in phones and laptops — may be made, mined or harvested by a child. Which is why this year’s World Day Against Child Labor highlights supply chains. The gnarly nature of these chains — and the many links in them — should concern us all. But if it took a global village to create this situation, a global village can also end it. At Winrock, we take a collaborative approach to eradicating child labor, addressing its economic, social and educational causes by engaging with governments and the private sector. Our private sector involvement is not just lip service; we work with companies from the inside, setting up mechanisms to monitor the presence of children in the workplace, incorporating child labor issues into company policies and more. We also know first-hand the willingness of governments to address child labor head on — not just because it damages the reputations of countries and companies who allow it, but because it’s the right thing to do. The government of Rwanda, where we have a project called REACH-T, has made child labor an issue in its national development plans. There is legislation prohibiting child labor and new policy guidelines to withdraw all children from the workforce and give them a chance to go to school. Equally encouraging is how these new policies are being embraced by an unlikely alliance of employer’s organizations, trade unions, private sector agencies, civil society organizations and, of course, families and children themselves. With rising school enrollment rates, Rwanda is proving that solutions, like challenges, do not exist in isolation. But Rwanda is not alone. In every country where we have projects striving to end child labor — Liberia, Tanzania, Ghana, Brazil, Malawi and Zambia — governments and private sector companies are part of the solution. In our newest project, we’re helping 40 cocoa-growing communities in Ghana design and implement their own plans for raising awareness about child labor. The project will propel more than 3,200 children back to school and give 1,600 women household members with the tools to improve their livelihoods and increase income levels. Forty cocoa-growing communities in Ghana are implementing their own plans for raising awareness about child labor. The Ghana MOCA-Youth project is just one of many ways we’re helping youth. 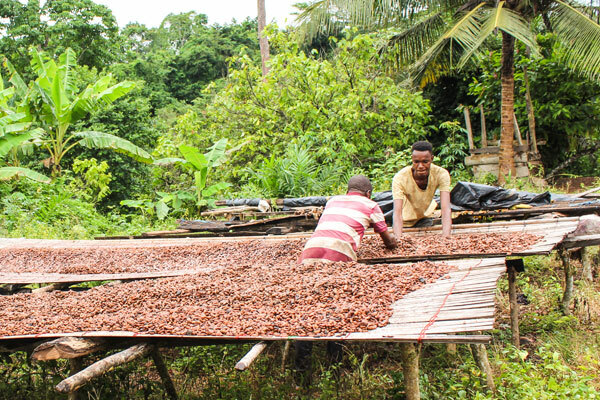 We’ve been involved in child labor eradication efforts in the cocoa sector since 2002, working from within the industry through the World Cocoa Foundation. And we applaud such private sector efforts as the fair-trade company Divine Chocolate and the 85,000 farmer members of the Kuapa Kokoo cooperative in Ghana who own it. The co-op has worked hard to eliminate child labor from its supply chains, and the commercial success it’s enjoyed is helping small villages build new schools. Whether in the rubber farms of Liberia, the tea plantations of Rwanda or the cocoa-growing communities of Ghana, children fare best when adults work together to make change. It’s not just the best way; it may be the only way.